Football is not only the most popular sport these days, but also the leading market in in terms of wagering and that’s why it is essential for punters to learn how to bet on football. Luckily the system is forthright and compared to other sports, football betting is easy to pick up and there are plenty of options to satisfy even savvy punters. Land-based bookmakers were the first to introduce football betting and players were presented with the option of placing their favorite selections on the betting slip. Initially, players were only allowed to play several games on a coupon but eventually they were permitted to wager on a single event. The transition to online betting was smooth and punters enjoy all their hard earned liberties and also have many more events to choose from. Speaking of online bookmakers, there are plenty of companies offering similar services and the odds are generally in line. Nevertheless it pays off to use odds comparison software or visit several websites to find out which has the highest odds for a particular event. Bear in mind that the same punters don’t have the highest odds on all football games all the time, and a little research goes a long way. 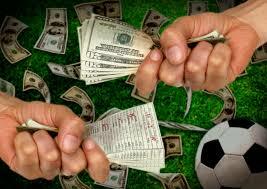 As for the betting process itself, it is every bit as simple as it used to be with brick-and-mortar bookmakers. Players need to check the box corresponding to the desired outcome, 1 – for a home win, X – for a draw and 2 – for an away win. In order to maximize the odds, players can add more wagers on the same betting tip and these are known as accumulators, with the odds being multiplied. One thing that needs to be fully understood is that an accumulators will need to have all selections matched to be a winner, and a single lost game would lead to the ruin of the entire coupon. Some bookmakers allow players to lay a particular team, which means that instead of betting on the club to win, they will cash in if that particular team loses or draws. Football betting is very similar to wagering on other sports and those who mastered these rather simple systems can extrapolate and use them to place wagers on other markets. Sometimes bookmakers also offer free bets or refund losing wagers during certain campaigns, and by using these free bets punters will only collect the winnings with the stakes being returned to the bookie.